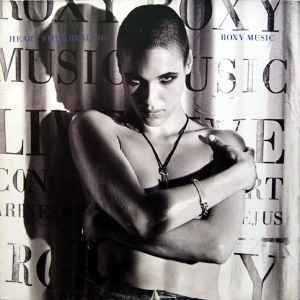 With one of the most androgynous and beautiful women of all on the Roxy Music covers, model Amanda Cazalet certainly sets the pace for this imposing collection of live material. There is much to rave about, though one could certainly make note of those artists from just a few years prior, and what they contributed to the sound of Roxy Music, who were absent for this show, nonetheless, discounting for a moment the breathless Roxy material, for me it was hearing the haunting “Like A Hurricane” by Neil Young along with the John Lennon classic “Jealous Guy,” both songs that bring this album up to date and infuse it with a bit of the unexpected, sparking me to consider what other songs I’d love to have heard Roxy music cover, with “Sweet Child O’ Mine” by Guns N’ Roses being right at the top of that list. The recording was laid down in 1982, though formally did not see the light of day until the 1990 compact disc release. There are those who are going to cite the live recording of Viva as a much finer and engaging production, though methinks this was merely an attribute of the earlier times and the band members that particular release encompassed. On Heart Still Beating, that absence can be heard if one strains their ears, though all and all, guitarist Phil Manzanera plays with a strident effortlessness, sounding both inspired and envisioned, with solos that firmly dance on the side of excellence, countering and matching Bryan Ferry’s vocal steps with a subdued passion and grace. adventure is more about the elegance charm and mystique of each note, rather than for any sort of weirdness and avant garde interplay. With that in mind, I found the outing to be a personification of all things lush and dark, where well known numbers were delivered in an atmosphere of introspection, one where the houselights were of no necessity, where the band moved in their own spacial inner-sanctum, as if playing to each other for the benefit of the audience. There are few live albums I am able to give myself over to, and Heart Still Beating fits me like a glove with its understated nature, an album made all the more rich and smooth with vinyl.